Born into a prominent Bangladeshi family, Bibi spent time in outlying villages in the rural areas of her country, soaking up the strong colours and distinctive patterns that marked out the fabrics made by local craftspeople. This childhood experience sparked an interest in hand-woven textiles that led her to Britain and become the first woman from her country to study at the London College of Fabric in 1972. In 1975 she modeled her own collection at the graduation show, which launched her modeling career. For nearly 20 years her beauty and grace populated the world’s fashion magazines and catwalks. In 1996 Bibi presented her first ready-to-wear collection at a fashion show entitled Weavers of Bangladesh, held at the UNESCO headquarters in Paris . UNESCO has supported all three of Bibi Russell’s major shows in Europe . The second show in August 1997, Colours of Bangladesh, at the Castell de elliver in Palma de Mallorca was launched and supported by HRH The Queen of Spain. Owing to Bibi’s growing popularity, she was made a guest at the cultural event Knitting Together Nations – Fashion and Crafts from Women of Bosnia an Herzegovina , jointly sponsored by UNESCO and UNHCR, held in December 1997. She was also voted Woman of the Year by Elle in 1997. In September 1998, with the support of UNESCO and the British Fashion Council, Bibi staged her third show in London, Stars of Bangladesh, where HRH Grand Duchess Maria Teresa of Luxembourg and Ms. Clare Short, a Member of the British Parliament, were guests of honour. The following year on 13 May 1999 the Fashion Space Gallery in London exhibited Bibi’s work, coinciding with her receiving an Honorary Fellowship of the London Institute in recognition of her outstanding contribution ot the field of fabric and design. UNESCO recognised her unfailing attempt to support human dignity, development and the eradication of poverty with the honorary title of Designer for Development, UNESCO Special Envoy on 4 October 1999 and the title of Artist for Peace on 27 November 2001. The year of 2003 proved to be another year of success for Bibi in promoting her cause. She was awarded You Can Change the World by the Club of Budapest and played an important role in presenting the Images of Asia fashion show in Denmark, dedicated to the weavers of Bangladesh. 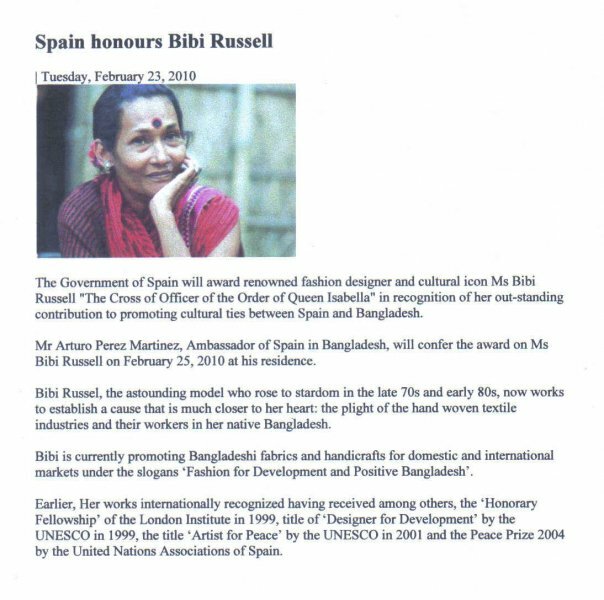 The United Nations Association of Spain awarded Bibi the prestigious Peace Prize 2004 for her efforts to fight poverty in Bangladesh and for her dedication in building a bridge between cultures, between modernity and tradition. Bibi Russell held her first show in Germany in 2005, presenting her spring/summer collection at IGEDO. To this day Bibi Russell continues to pursue her commitment to fighting poverty and improving the social and economic development of weavers in Bangladesh . Fashion for Development seeks to blend the creativity of the local artisans with that of Bibi’s professional design and fashion background to secure market outlets for the artisans and thereby preserve and revive the weaving heritage of Bangladesh . SO Ethic is honored to be associated with a name like Bibi. We welcome her on board. >Fantastic! People like Bibi make fashion take action.